Tomás Alonso has been travelling since the age of 19 to pursue his career as a designer. He has been living, studying and working in the USA, Italy and Australia before moving to... Read more London to complete a MA at the Royal College of Art.In 2006 he co-founded the design collective OKAYstudio with 5 other recent graduates from the RCA. His work has been widely published and exhibited, from the Design Museum, Aram gallery or Whitechapel Gallery in London to exhibitions in Italy, Spain, France, Canada, Japan... He has been recently included in the permanent collection of the Design Museum in London. Tomás Alonso has also received numerous international awards including the First prize in the Promosedia International Design Competition 2008 with his chair No.7 His practice is based in Stoke Newington, North East London, alongside the activities of the collective his work specialises in furniture, product, lighting, interior and exhibition design. He combines his research and commercial design work with occasional teaching and workshops; most recently he has been teaching the product design Master course at ÉCAL in Lausanne, Switzerland. There is a strong human influence in Tomás´ work. He is interested in the relationship we have with objects and how these objects relate to us and other things around us. He also experiments with different materials to make the most of their properties to find new ways to create structure. 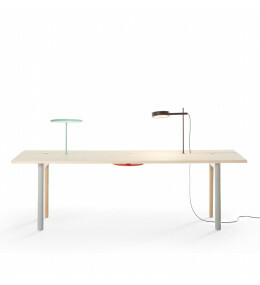 Modern Offset Table is a distinctive workstation with a line separating the top in two sections.